We have been successfully increasing our printed and digital circulation and exposure of Trainer magazine worldwide for a while. We are now offering bespoke digital packages to share in our expertise and give you further exposure to the racing industry online. Using the major social media platforms of Twitter, Facebook and Instagram we can create posts for either your storyboard content or content you give us (for use on your own social media). Individual online campaigns for key events or new products. 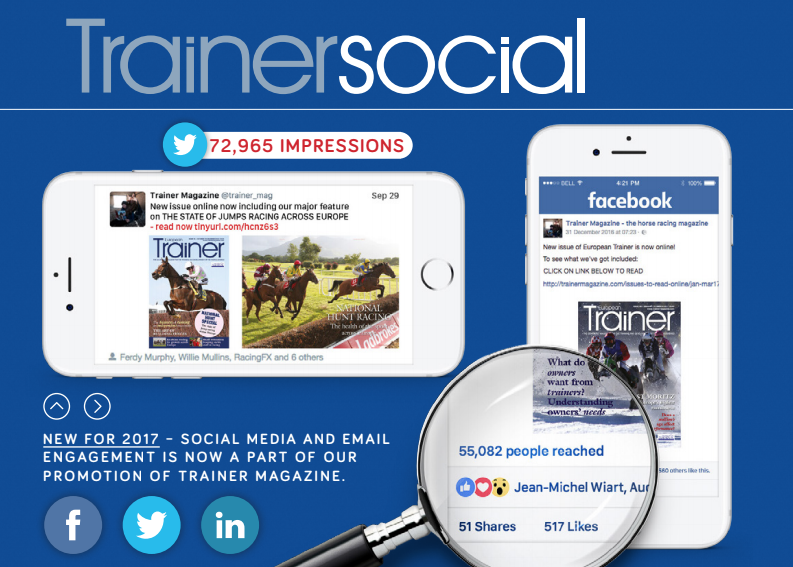 Promotion through Trainer magazine social media accounts to all our Trainer followers or through your own social media accounts to engage a wider audience beyond your followers. We post for you to target an extended equine industry audience, relieving you of precious time and worries! To complement the advertising and management packages, we offer the opportunity to tailor your recipient audience. Posts can be targeted to demographic criteria and targeted at times of day to give best responses. Posts are designed to engage platform users with your content and can be linked to a landing page. Prices for basic social media advertising start from just 2.3p / 3.25c per impression.